Location: Ystad, Scania, in southern Sweden. 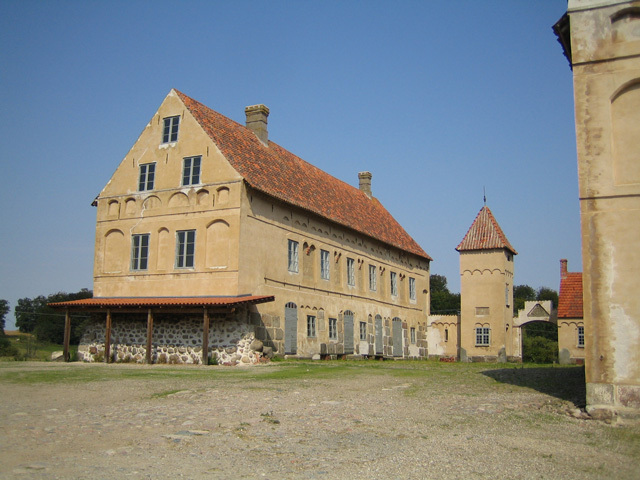 Notes: Bjarsjoholm Castle or Bjersjoholm Castle (Swedish: Bjarsjoholm slott or Bjersjoholm slott) is a Renaissance castle from the 16th century, 3 km northwest of Ystad, Scania, in southern Sweden. Originally consisting of four brick buildings built around a courtyard, the present castle consists of two buildings, with a newer addition close by. The newer addition on the estate, the Bergsjoholm Castle (Swedish: Bergsjoholm slott), was built in Romantic, German style in 1849-50, on a hill just south of the old castle. It is a three-story building flanked by two square towers. In 1890, one of the Renaissance buildings needed extensive renovations and only the gables could be saved.